In 2009, hubby and I went to Europe for the first time. In contemplating how to celebrate our 30th wedding anniversary, we realized we were the only ones in our family who hadn't been. Both of our kids had, our parents, all of our sibs, nieces and nephews. Yup, everyone but us. It was time to rectify that. fast forward . . . .
After 15 hours of travel, we arrived in Florence, Italy, and after dropping our bags in our room, of course we headed out exploring. Just a half-block away, we turned a corner, and saw this. I'm not exaggerating when I say I immediately, involuntarily, stepped backwards around that corner. It took a few moments before I could catch my breath and peek around the corner again. And ever since, I've considered that moment I first saw Il Duomo di Firenze my first meaningful glance of Italy. The next morning, we hurried back over to the Duomo and climbed to the top (463 steps!) and were once again mesmerized by what we saw. 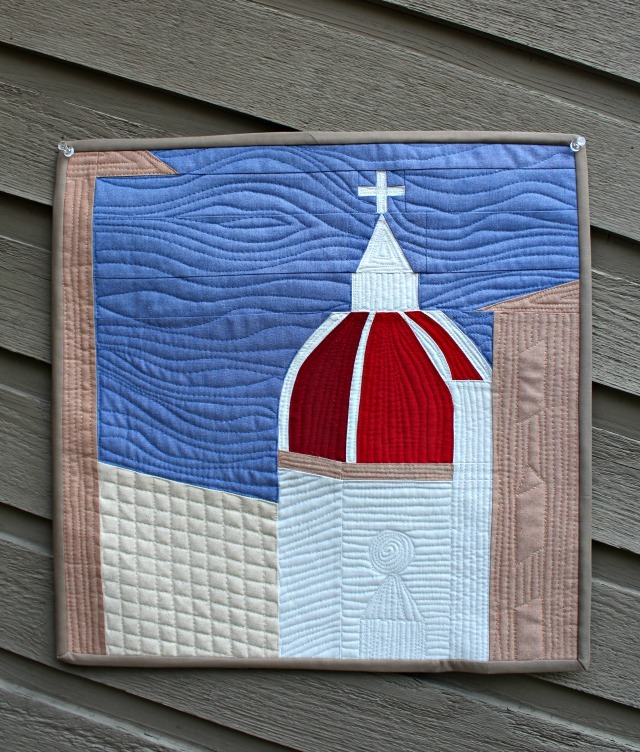 Florence was a perfect introduction to Europe, and that photo of the Duomo came to mind as I read about this month's Mighty Lucky Quilting Club challenge: Using a Personal Photo as Inspiration for Piecing with Alison Glass [alisonglass]. I shared much of my beginning process in a previous post, but I'll back up just a bit to tell about the materials I chose to use. Fabrics for the front were mostly shot cottons from stash and one scrap of Essex. I loved the feel and bit of sheen, and had the perfect colors for the dome of Duomo. For backing, I thought a print from Angela Walters' Drift was the perfect choice, and reminded me of so many windows we'd seen in Italy. I knew when I chose the shot cottons that they would be really lovely to quilt up. 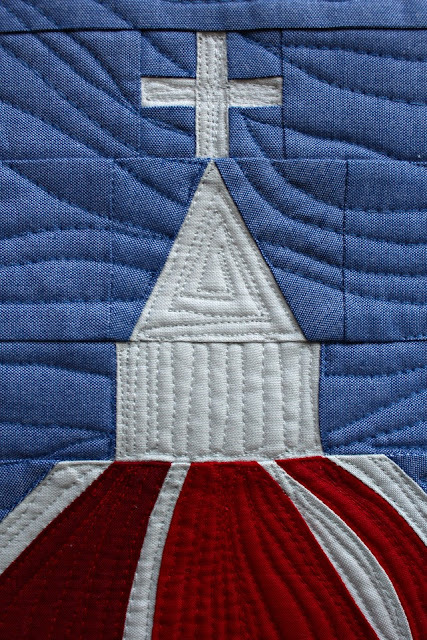 I used five Aurifil 50wt threads - 2000 (light sand), 2250 (red), 2314 (beige), 2600 (dove), 2730 (delft blue) - each to emphasis an element of my 'fabric photo'. And I went out on a limb and chose to free-motion quilt this one - totally not my norm, but in this case seemed worth the stretch. I attempted to add more of the photo's detailing, and overall I think that worked. I especially like how the dome turned out, and the 'windows' on the right side. I'm a little disappointed with what I did in the sky portion, but I was on a roll, and while I was quilting away with those feed-dogs down, I figured I should practice something other than straight lines. So there ya go. Overall, I found this project to be very challenging improv-wise - not the curves, but the 'corners'! But I think I learned something important in my decision to 'crop' my photo for the final quilt, which is only 17" square. I actually think the lack of detailed piecing in the buildings allowed that dome to remain the focal point and the overall piece, an uncluttered look. It seems in the challenges so far, there is the obvious stated challenge, but always something more to learn, and I think that's my been my favorite part. This is a beautiful quilt! I love that you took something you saw and turned it into a piece of art. I am visiting Florence in Sept and hope I'm inspired in this way. 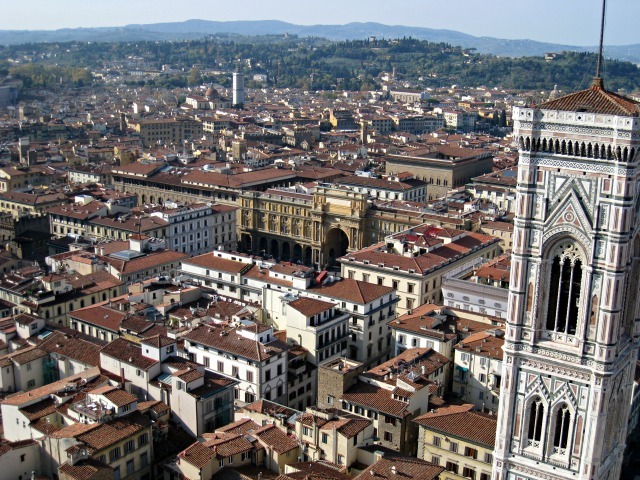 Florence is one of our very favorite cities to visit. The stairs are a real challenge, but so worth the view. Your Duomo piece is lovely. Wow, what a powerful memory to go with the photo and now mini quilt. Great choice and I think it turned out quite beautifully. You captured it beautifully! I love your story! Such a lovely momento of one of those stand out memories and so beautifully executed. That is an amazing photo - and quilt! I have been itching to go to Europe again for awhile. The Duomo is a perfect way to be welcomed to Europe! And you have done a "magnifico" job rendering it in fabric and thread! I can't believe you climbed the stairs!! So impressed! Love your quilt and your story! Inspiring! Your enchantment with Florence shows up in your snapshot quilt. Nice. I love all the quilting textures! Well done! Debbie, what a wonderful depiction. 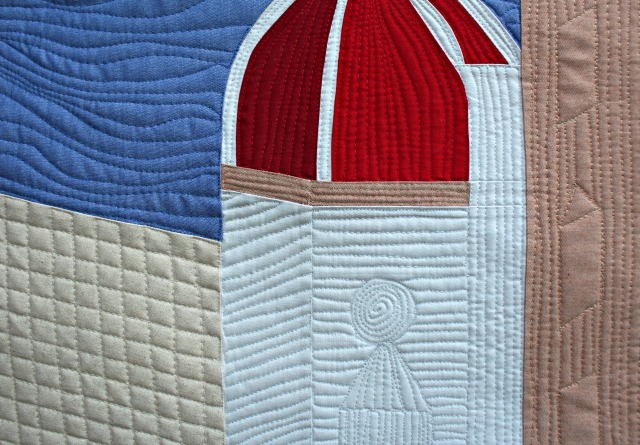 I totally agree that less piecing lets the dome stand out, but your quilting really makes it! Beautiful job! I was already in Florence. Beautful City. Beautiful Quilt. This is amazing - I think you did a wonderful job of capturing the essence of the photo and your quilting adds the perfect touches of details. I haven't even started on this month's challenge - I'm totally stumped and don't even which photo to choose! Congratulations on bringing the essential elements of the photo into your quilt. It's not easy to choose what to take out. I have stayed in a hotel just behind you to the left when you took the photo; such a fabulous location. My first view of the Duomo was shortly after sunrise on a May morning and the green and pink marble positively sparkled. Never to be forgotten! Wonderful interpretation of that stunning photo. Now I want to go to Italy! It's one of the countries in Europe that I haven't visited -- and I've heard so many wonderful things about it! I loved watching the progress of this quilt unfold -- it's amazing how you've recreated this photo! Debbie, I love everything about this piece! 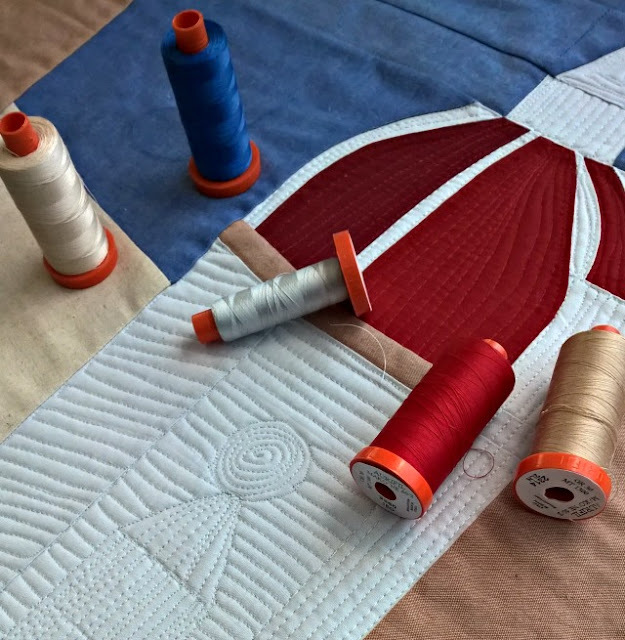 I think your free motion quilting looks great! I'm glad I climbed the Duomo once. The second time, I let Bill take the kids up while I shopped for dinner. A little too claustrophobic for me! The dome of St. Peter's at the Vatican is not as tight. The leaning tower of Pisa is fun to climb! WOW is the only word to describe so much of the ancient architecture. When I was there, they were getting ready for Jubilee, so much was covered with scaffolding. Stairs were blocked, but nonetheless a stunning building. Hard to believe that it was built without our modern equipment. This looks great! I love all the stitching and how it makes the rest of the piece pop! A late comment...but I have to say, Double Wow! 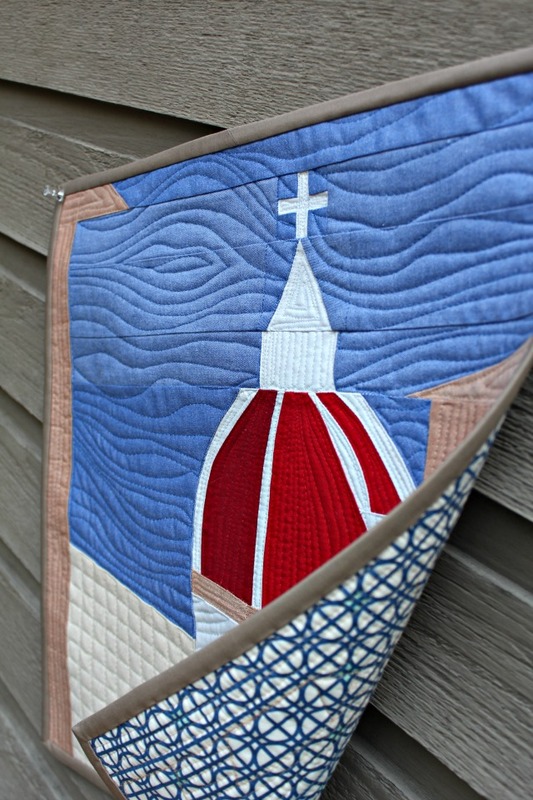 I think what you have achieved with your Duomo quilt is so clever. My husband & I went to Italy for my 50th, our first European trip (from Australia, such a long flight!) We missed seeing a lot of Florence as I was ill, but one day I would love to return there. Thank you for sharing your process about your method & fabric choice.